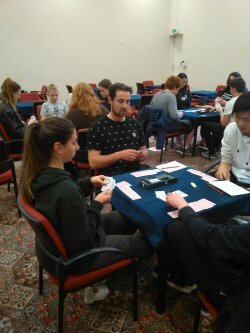 They came from Auckland, from Oamaru, from the Wairarapa and Wellington, from the Central North Island, from Dunedin, the Waikato and from Canterbury, 38 in total to this year’s Youth Bridge Weekend which was held over the weekend of August 17th-19th at the Wellington Bridge Club. They came to have a good time…and to play a hand or two of bridge…and it seems they achieved both aims. We know they played 110 hands, officially… but there were many more hands played during the breaks as well. “Can I borrow a pack of cards?” was a frequent request. Some of the bridge was relatively serious. They had a “Play with a Pro” session where they played with Wellington bridge players. They had a Par Bridge Contest where they played boards and were given marks when they bid, played or defended a hand successfully. They played an Individual where each player had 18 different partners. 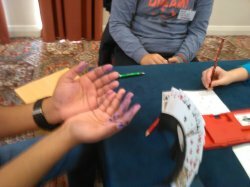 There was the usual Speedball Teams and also a three round Handicap Teams…and then there was Crazy Bridge! How would you value these two hands? Which hand would you rather have? That East hand does not look that flash but, wait a minute, on one particular round, 2’s were the highest cards in the pack while aces were the lowest. So, 4 for a 2, 3 for a 3 etc and suddenly East has an opening hand, a 12 count! Shame about the lack of twos. West, of course, had a mere 5 count and opened their hand 2 , a weak 2! Got the gist? So, next time you pick up a succession of yarboroughs and 2 counts (you normally do, don’t you?! ), suggest you play “Crazy Bridge”…and there were many more variations of our standard game as well. his pen exploded while considering his next bid! It was not all playing. 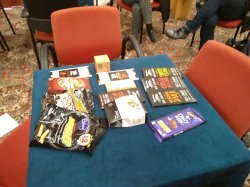 There was a realistic session where bidding mistakes were discussed, under the heading “What Went Wrong?”. Many of the players were fresh out of Beginners’ Classes and this could have helped cementing a few uncertainties in the area of bidding. There was a bridge quiz (Do you know which are the one-eyed jacks?) and there was a bridge movie about a US Youth Team at a previous World Youth Championship. There was also a session where the players were asked what they liked about the game and what were the drawbacks in getting youth to play the game. Their feedback will be used in NZ Bridge’s forward planning re Youth. The age range was 10-25: “quite wide”, you might say. Yet, it seemed to work, with the game of bridge binding them all together. The Weekend would not happen without a lot of support and for their varied contributions, I would like to thank Nebojsa Djorovic, Martin Reid, Nigel Kearney, Johnny Davidson, Greg Aldridge, Peter Newell, Dean Sole, Bridget Willcox, Kathy O’Halloran, Mindy Wu, Jan France, Allan Joseph,Maureen Pratchett,those who dealt the boards,billeted the out of town players and all those who came along to play with them on the Saturday night, as well as, of course, the Board of New Zealand Bridge for its support of the event. This story deserves to be told because if our young players continue with such an excellent attitude at the bridge table, then our game will blossom. The declaring side stopped in 3 . It soon became obvious to all at the table except for the declarer that the declaring side had missed game in any of two or three strains. Yet, the rather inexperienced declarer struggled taking a somewhat unusual line but emerged with 9 tricks. “Well played” our defender said, with not a touch of sarcasm, to the declarer whose beaming smile made him feel on top of the world. I doubt many seasoned adult players would think to make such a comment. With such nice young players as Eslyn Beck around, the future for our game is promising. Hopefully, we will see a number of these young players take part in Hamilton’s National Youth Teams on Friday September 28th. p.s. in case you hyave not noticed, the one-eyed jacks are the major ones. I am sure you knew that?